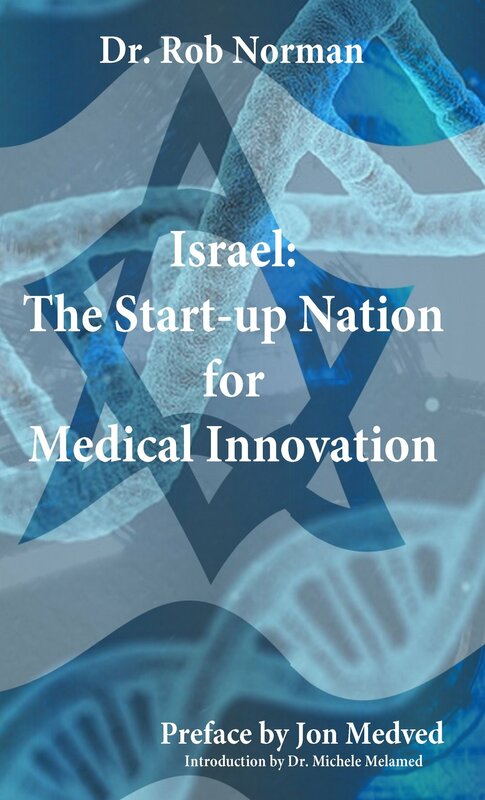 How is it that Israel, with just 8.5 million people, only 69 years old, with few natural resources and minimal infrastructure, is a world leader in producing medical and biotechnology start-ups and companies and is first in the world for medical device patents per capita? Israel is surrounded by enemies trying to wipe it out. The country has been in constant war and turmoil since its founding in 1948, yet thrives in adversity. Economies as diverse as Dubai, India, Ireland, and Singapore have tried to mimic the "Israel effect." On my many trips to Israel as the national chairman of the Jewish National Fund’s Doctors for Israel, I have observed the amazing life-saving and life-enhancing advances of Israeli medicine and discussed the future of medicine and science with many leading scientists. I visited the makers of ReWalk robotic exoskeleton (featured on the hit TV show “Glee”) that enables paraplegic runners in London and Tel Aviv to complete marathons and spent time at Given Imaging’s PillCam capsule endoscopy company. The list of amazing technologies provided by Israel keeps growing. Among the numerous people on the cutting edge of Israeli medicine and science is Eran Perry, managing director at Israel Health Care Ventures (IHCV), one of the largest venture capital funds in the country. “It’s almost a cliché to say Israel is an excellent place for medical innovation,” Perry said in an interview. “But if you look at global statistics, it’s evident — from the total expenditure on civilian R&D, where we are ranked first; to human infrastructure and entrepreneurship, where we rank in the top five. You can see the results in patents. We are first in the world for medical device patents per capita, and second in Europe for bio-pharma.” I believe this is one of the most important times in the history of medicine and science and that Israel plays a key role. According to the newest data, more than 1,000 Israeli companies are in healthcare or life-science products, including 700 in medical devices, and approximately half are already generating revenue. I will highlight numerous accomplishments by Israeli medicine and science companies and provide compelling reasons why Israel is a world center in innovation. My book is historical fiction based on the life of the former African-American slave Jebari, who overcame enormous hurdles to become a Black Seminole hero. I believe this book should be read by every person, young and old, and especially for those of African-American, Spanish, and First Nations heritage, to learn how our country was founded and the unique roles of our diverse citizenship. An eco-thriller that is compelling and filled with adventure! Revenge is the first in a series featuring eco-superstar Dr. Jack Tolliver. The infamous Dalton Gang comes alive!! One of the best Westerns in many moons. Read it now! Today the Star of David is the universally recognized Jewish symbol, but was that always the case? In this fascinating work that includes dozens of full color photographs, Dr. Norman explores the use of the hexagram through its use in Judaism, Christianity, and Islam, as well as in Buddhism and Eastern philosophies. What was it about the hexagram that made it so attractive in multiple faith traditions? He explains that the earliest documented use of the hexagram is in Capernaum in the sixth century, and was displayed prominently in Prague in the thirteenth century, but it did not become the defining symbol of Judaism until the 1930s, when Nazis forced the Jews to wear a yellow hexagram to indicate their Jewishness. The Star took on new meaning at that point, and then when it was adorned on the flag of the State of Israel in 1948, it took its place as one of the great religious symbols. We are at the crossroads of a major transformation. Why is our current time so important in the history of man? We are at a point where we may be the last generation that is not partially or fully bionic. The last natural man: natural in what way? What is “natural”? Is it a catch phrase like “integrative” or “holistic” that transmits a certain magical warm glow? If the word “natural” was a plant, it would be beautiful, green, luxuriant, and edible.Does it mean we are the last to not replace or modify our parts? What about laser surgery? Knee or hip replacement? Botox and fillers? Chemical therapy? Or a directional chip in the brain?Do we really mean the very last natural man? Cultural evolution has been the major driving force over the last several thousand years and enormous in its influence compared to almost invisible changes in our physical adaptations. If cultural and religious evolution was the driver for human history, are we now entering the phase of physical transformation – where humanity refuses to accept mortality and seeks to make changes to defeat nature. In this book the authors are describing a paradigm shift of all of humanity— just as hunter-gatherers had their stellar features, the future man will have many attractive qualities, even if many artificial. We are often balancing on the precipice between science and science fiction, now ready to tip the scales and slide comfortably into the future of great discoveries and wonderful changes. But are these changes all for the good? What will being human mean? Spanish explorers arrived in Tampa Bay in the 16th century. Jews were first allowed to live in Florida in 1763 and less than 100 years later, Tampa became a city. The arrival of the railroad and the cigar industry in the 1890s attracted immigrants. Many were Jews, who helped propel growth, especially in Ybor City, where they owned more than 80 businesses. Over the decades, Jews participated in civic and Jewish organizations, the military, politics, and in developing Tampa as a sports center. Today, with about 23,000 Jews in Tampa, there are fifth-generation residents who represent the continuity of a people who contribute vibrancy to every area of the community. Written by a leading dermatologist, The Blue Man and Other Stories of the Skin provides a compelling and accessible introduction to the life of our largest organ, while also recounting the author’s experiences with memorable patients he has treated who suffer from mysterious skin conditions. Robert Norman begins by highlighting the qualities of the skin, tracing the history of its conditions and diseases, then examining the cultural, social and psychological impact of both color and irregularity. The book also features an absorbing collection of stories about some of his most intriguing patients: from a man whose skin mysteriously turned blue, to a hypochondriacal woman who begins to show signs of a life-threatening disease. This is a fascinating account of the dynamic nature of the skin, and the people who inhabit it. “Vital Signs,” a popular column featured in Discover Magazine, has long been a favorite of readers, showcasing, each month, fascinating new tales of strange illnesses and diseases that baffle doctors and elude diagnosis. Each tale is true and borders on the unbelievable. It’s no wonder that throughout the years the column has become an unofficial textbook for medical students, interns, doctors, and anyone interested in human illness and staying healthy. Now, physician and “Vital Signs” editor Robert Norman has compiled the very best of the series into an intriguing and suspenseful collection for fans and new readers alike. A young woman carries a baby that wasn’t her own—and wasn’t even a human; Aretha Franklin gives a physician the insight needed to save a life; a modern gynecologist faces an ancient disease. These cases and more, representing a wide variety of unique medical anomalies and life-or-death situations, bring readers to the front lines of the medical fray. Fans of hit medical dramas such as House MD will savor the opportunity to read of the real-life cases that puzzled doctors, the gripping detective work that ensued, and the completely unexpected, often life-saving diagnoses. Discover Magazine’s Vital Signs is a glimpse into the exciting work of real medical professionals, told from their perspective, and revealing that anything can happen in medicine. Readers will never look at a “routine check-up” the same again. Prior to its incorporation in 1855, Tampa Town--as it was then known--was a desolate place to live, and disease and isolation kept many from settling in the area. But as the century progressed, a new and exciting mode of transportation began to open up America's remaining frontiers, including the untamed Gulf Coast of Florida. When the railroad came to Tampa, thousands of adventure-seekers, tourists, and new residents came with it, all ready to soak up the balmy breezes and tropical pleasures of the city of Tampa. Tampa began to resemble a modern industrialized city by the turn of the century, due mainly to the grand vision and plans of one man. Henry B. Plant encouraged Tampa's growth by bringing the railroad to town and constructing the elaborate Tampa Bay Hotel, and he, along with other entrepreneurs, brought an economic boom to the region with new industries, such as cigars and citrus, and the promotion of tourism. The Ocala National Forest, founded on November 24, 1908, by Pres. Theodore Roosevelt, is the oldest national forest in the eastern continental United States. The forest is one of central Florida's last remaining expanses of forested lands with magnificent palms, towering live oaks, and the largest sand pine scrub population in the world. The Ocala National Forest contains major springs, including Salt Springs, Silver Glen, Alexander, and Juniper Run. In addition to several wilderness areas for visitors seeking primitive conditions and solitude, the forest has visitor centers, nature trails, and a section of the Florida Trail. Images of America: Ocala National Forest is filled with fascinating stories and exciting facts on the history of the steamboats, logging, trails, movie sets (including The Yearling, based on the Pulitzer Prize-winning novel by Marjorie Kinnan Rawlings), Cracker cowboys, modern conservation efforts, and more. This book is an inspirational collection of tales from Dr. Robert Norman's 18 years as a dermatologist in Tampa, Florida. Based on real-life experience Dr. Norman explains ailments of the skin, including melanoma, warts, albinism and toxic epidermal necrosis, exploring the condition's history and etiology, and talks us through diagnosis with his patient stories. This book is invaluable reading for practicing and aspiring dermatologists and practitioners in primary care. The first novel ever written on trap shooting. Motivational and exciting, it is destined to be a classic in the sports and shooting field. Meet Dennis Padric O’Tool, brave knight in beat-up armor, as he slays the bad guys, finds true love, works with an old friend, and watches his daughter learn the tricks of his trade. Think of a mix of John D. MacDonald Travis McGee and Robert B. Parker’s Spenser and you get Dennis Padric O’Tool. “And now, my dear graduates, as I conclude, I leave you an important message, one that I urge you to remember. Dr. Amelia Lattimore stepped from behind the podium. The applause that echoed from the walls of the University of Chicago chapel filled her with a sense of pride. More than twenty years earlier she had been sitting in a pew in this very chapel and, along with fellow medical school graduates, had listened as an Illinois state senator regaled them with stories of his conquests in the political arena. She could not then envision herself ever returning to address eager students, their families, the faculty, and others who had gathered in this traditional site for accolades. Amelia shook hands with the Dean of Students, a gangly, affable fellow named Harold Hakes, before taking her place on the stage, standing to greet each new graduate and taking her part in the handshaking and congratulations. After the ceremony was over, those who wished to have a picture taken with her or who wanted her autograph surrounded Amelia. She posed and wrote until she satisfied everyone who had clamored for her attention. Groups of families and friends huddled together on the sidewalks and lawns as Amelia stepped out into the brilliant sunshine. Cameras flashed everywhere; people exchanged hugs and kisses; high heels clicked on cement; congratulations filled the air. She walked the short distance to behind the chapel where she had parked her car, removed her cap and gown, and put them on the back seat. She then closed the back door, climbed into the front seat, pulled out of the parking lot, and headed down the street. She glanced in the rearview mirror to check her make-up before heading for the reception at the faculty club. But, for a second, eerily and briefly, the face she saw was not that of a veteran physician with a twenty-five plus year career who had just delivered the graduation address at her own alma mater. The faded complexion, dimming eyes, and graying hair gave way to the image of a young woman whose blue eyes outshone the brilliance of the sky above, in whose inquisitive mind the love of medicine had recently gained a permanent berth. She looked ahead at the road and then back to the mirror again. Behind her, she noticed a group of teenagers in a convertible. Another blink of the eyes and there she was, Amelia Lattimore. Only this time, it was the Amy of long ago, on another sparkling Midwest summer day when she was with her friends on the way to Lake Michigan. Jose Cartegna is a farmer, but his livestock is women and his crop - babies. Taking advantage of the distressed Mexican economy and the high demand for adoption in the United States, he develops a huge and profitable network for the acquisition and sale of infants. The network includes agents in the United States, like Carol Jackson, who solicit new clients. Jack and Susan Medford, a couple who desperately seek a child, are caught in Jackson's sticky web of deceit, while Mexican Federal Inspector Anthony Vega plays a game of life and death chess with Cartegna. If you want a suspenseful thriller that takes you through nail biting turns, Baby Farm is for you! Think Get Smart meets Naked Gun and you have Mastero, Medical Detective by Dr. Robert A. Norman. Join Mastero, a dermatologist by day and detective in the evenings and on weekends, his boss Pickles, girlfriend Misstera, and dog Flipsy as they stop crime in its tracks and enjoy life. A fun-filled ride for all!! This book by Dr. Robert A. Norman, board-certified physician and surgeon, is filled with wonderful patient stories and essays on medicine. Personal insights are intertwined with the tales his patients reveal behind the closed doors in his office. One of the essays in this book was published in Discover magazine, and many of his writings have been published in nationally-recognized journals and magazines. Gaspar Returns is the compelling story of the dramatic return of the famous pirate Jose Gaspar. Jose Gaspar, or Gasparilla as he was known in later life, was said to have been born near Seville, Spain, in 1756. He was reported to be "small in body, perhaps, but imbued with the stamina of a Spanish fighting bull, the courage of a cornered leopard, and the cunning of a black fox. He was kind to his friends, dangerous to his enemies, and always true to his word." Stories about Jose Gaspar are varied--from the time he, at the age of twelve, kidnapped a neighbor's daughter and tried to collect ransom, to his promotion at age 26 to the rank of admiral of the Middle Atlantic Squandron, his subsequent betrayal by the King of Spain, his war against Spanish holdings for 26 years, and his reported suicide when he was about to be captured. Gaspar had been "a Spanish officer of high rank, a pirate, a seducer of countless women, a wholesale murderer of human souls, and the last, and perhaps greatest, of all the pirates who operated in the 1800's." Jose Gaspar, in fact, may have had much to do with Florida’s becoming a part of the Union, for if he had not settled on its West Coast and become a major pain to Spanish commerce with Cuba and Mexico, Spain might have been less willing to sell Florida to the United States. Gaspar returns to the world of the early 21st century, to traffic jams, fax machines, fast food restaurants, jet planes and speed boats, and sophisticated banks and security systems. He learns the habits of his new times quickly and builds a following through charisma and cunning. Jack Medford, a Tampa journalist, becomes a friend to Gaspar. Medford learns of another side to the legendary pirate. The story of Gaspar, on which Tampa Bay's renowned Gasparilla celebration was originally based, and his return to our time, is one that makes you turn the pages with anticipation until its exciting finish.